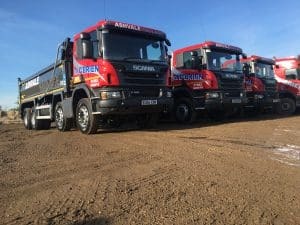 My name is James O’Donnell director at Ashvale Haulage Ltd. Ashvale Haulage specialises in Muck Away, Aggregate deliveries and various other activities across London and the South East. As we operate in the most congested area of the UK we are mindful of the difference we can make and always aim above the basic requirements. We were asked to consider FORS in 2015 along with our sister company M’Obrien Plant Hire, after seeing more and more companies proudly displaying their accreditation we decided in 2016 to go for Bronze and work toward Silver this year 2018. The Bronze audit was a lot more in depth than we expected, but we had invested a lot of staff hours ensuring that we followed every inch of the FORS Standard. I would point out that the Bronze Audit should be respected and planned for to ensure a pass is achieved. After our initial Bronze Audit we started trickle feeding our drivers onto the Elearning Modules specifically surrounding Cycle Safety and the Safe Urban Driving too. As we are members of FORS we were fortunate enough to gain funding for this which certainly helped us make the decision. We straight away spotted the benefits of using the tools within FORS to monitor and maintain the Fleet Data, we then invested heavily in Telematics and now have access to the FORS Tool Kits and our own Data allowing us to develop fleet efficiency in the right direction. With our immediate aim being to achieve Gold we set our sights on how to achieve this level, we have communicated the benefits of FORS to all our Sub Contractors and some of our customers offering them help if they need it. We have benefited so much by maintaining our contracts and gaining more work because of the demand for compliance amongst Large Goods Vehicle Operators. Due to our comprehensive inductions and continuing development of our drivers we are easily able to monitor their fitness and health status’s. We are fortunate enough to have a good reputation amongst the driver community and have a very small percentage of staff turnover. We are also in the commanding position to be able to recruit from within the ranks so to speak. We have purchased an App to record and monitor our vehicles noise pollution for all our staff dealing with Health & Safety. Our drivers Health & Wellbeing is at the front of our minds and that of the public too, so we can monitor this effectively moving forward. Modal shift and alternative vehicles – how have you attempted to move part or all of your consignment from road to an alternative transport mode or used electric or alternatively-fuelled or powered vehicles within the fleet. 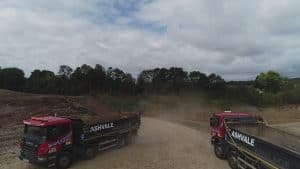 At Ashvale Haulage we pride ourselves on ensuring our fleet is as up to date as possible, has the EURO 6 Engines in operation and is as close to Hybrid Efficiency as possible. We pride ourselves on having an efficient management team within maintaining strict adherence to manage every aspect of its business, compliance and ongoing monitoring of its fleet. With plans going forward to support smaller companies in their FORS Journey and a progression through the Practitioner Modules for all our team we are doing everything we can to be as proactive as humanly possible. To Conclude, FORS has supported Ashvale Haulage to act quickly, efficiently and effectively to implement the correct practices to ensure the fleet continues to operate as safely as possible. We have ensured there is a framework of type that ensures compliance at all levels of the business to be up to date on every aspect of our role in the industry. Essentially we now have access to all the tools such as training courses and Elearning that would not be available to us without FORS and I doubt we would seen the benefits without it.